What boggles Sci’s mind is the tiny scale on which this is happening (the order of microns, a micron is 0.000001m), and the SPEED. This happens FAST. Every movement of your fingers requires THOUSANDS of these signals. Every new fact you learn requires thousands more. Heck, every word you are looking at, just the ACT of LOOKING and visual signals coming into your brain. Millions of signals, all over the brain, per second. And out of each tiny signal, tiny things change, and those tiny changes determine what patterns are encoded and what are not. Those patterns can determine something like what things you see are remembered or not. And so, those millions of tiny signals will determine how you do on your calculus test, whether you swerve your car away in time to miss the stop sign, and whether you eat that piece of cake. If that’s not mind-boggling, what IS?! Indeed so. The dance of molecule-size entities and their integration into the beginning or end of a neural signal happens so dizzyingly fast it defies the imagination. And yet what happens in between a neuron's receipt of a signal and its own release of one—the propagation of an action potential along the length of a neuron's axon—can be incredibly slow by comparison. Witness a wonderful description by Johns Hopkins neuroscientist David Linden, which science writer JR Minkel calls "The most striking science analogy I've ever heard." I won't steal the thunder of JR's brief post by quoting Linden's comment, but read it and you'll see: that's slow! Remember, too, that in Linden's thought experiment, the giant's transatlantic nerves are presumably myelinated (because I'm assuming that even planet-spanning giants still count as mammals). That is, her nerves are segmentally wrapped in fatty myelin tissue, which electrically insulates them and has the advantage of accelerating the propagation speed of action potentials. Most invertebrates have unmyelinated axons: in them, action potentials move as a smooth, unbroken wave of electrical activity along the axon's length. 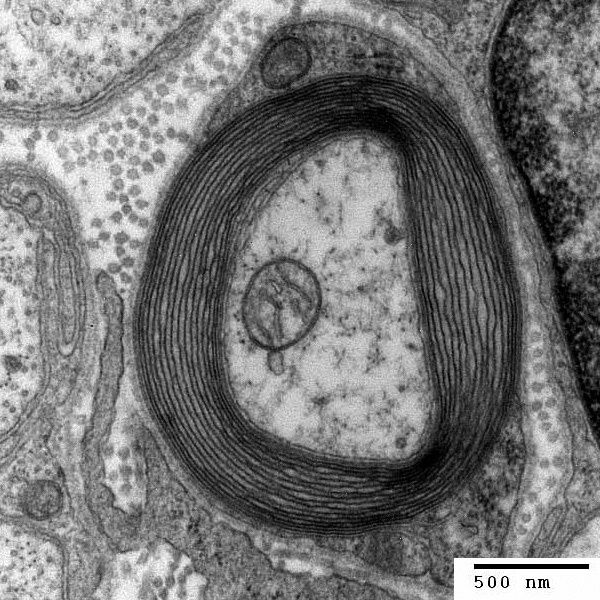 In the myelinated axons of mammals and other vertebrates—which apparently have more need of fast, energy-efficient neurons—the action potential jumps along between the nodes separating myelinated stretches of membrane: the depolarization of membrane at one node triggers depolarization at the next node, and so. Because of this jumpy mode of transmission (or saltatory conductance, to use the technical term), the action potentials race along in myelinated neurons at speeds commonly between 10 and 120 meters per second, whereas unmyelinated neurons can often only manage between 5 and 25 meters per second. Roughly speaking, myelination seems to increase the propagation speed of axon potentials about tenfold. The speed of an action potential also increases with the diameter of an axon, however, which is why neurons that need to conduct signals very rapidly tend to be fatter. (Myelinless invertebrates can therefore compensate for the inefficiency of their neurons by making them thicker.) I suppose that someone who wants to be a killjoy for Linden's great giant analogy could question whether his calculation of the neural transmission speeds took into account how much wider the giant's neurons should be, too: presumably, they should be orders of magnitude faster than those of normal-size humans. If the width of the nerves in Linden's giant scaled up with their length, how much faster than normal human nerves should they be, and how might that affect the giant's reaction time? Suppose the giant was not a fee-fi-fo-fum human giant but an ultramega-giant squid with unmyelinated neurons? How fast would the nerve signals travel in it? Update (added 8/24): Noah Gray, senior editor at the Nature Publishing Group, notes that Sci accidentally overstated the size of the synaptic cleft: it's actually on the order of 20 nanometers on average, not microns. Point taken, and thanks for the correction! Sci may well have fixed that by now in her original, but I append it here for anyone running into the statement here first. Further amendment to my update: Actually, on reflection, in her reference to microns, Sci may have been encompassing events beyond the synaptic cleft itself and extending into the presynaptic and postsynaptic neurons (for example, the movement of the vesicles of neurotransmitter). So rather than my referring to this as a mistake, I'll thank Noah for the point about the size of the cleft and leave it to Sci to clarify or not, as she wishes.